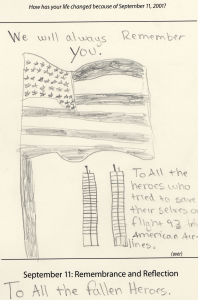 A visitor sketched this while reflecting on the events of September 11. Visitor responses to those questions are preserved in the September 11 Digital Archive’s collection Smithsonian National Museum of American History, Visitor Responses on the Tenth Anniversary in 2011. Exhibit visitors came not only from the United States but also countries across the globe, including South Africa, and ranged widely in age, such as this respondent, who was only three months old when the attacks occurred. Some visitors to the exhibit chose to sketch, such as one individual who drew a cell phone with no service, or this nine-year-old, who drew the two towers. Some respondents reflected on their work, volunteer efforts, and the ways in which they serve others. One visitor wrote that her husband, a servicemember in the Army, has been sent to Iraq twice, while another was “honored to work at TSA.” Justin said that he “didn’t have much of a sense of patriotism” prior to September 11, but after the attacks he he was motivated to “help my country and to prevent future occurences [sic] such as this…I enlisted in the Navy.” Melissa Cummings’ father boarded a flight the morning of September 11, shortly before Flight 77 which crashed into the Pentagon. She now volunteers at her local fire and rescue service. Visitors to the exhibit included first responders, such as Chaplain Glenn George, who worked for two weeks at Ground Zero, and this individual, who was in an Army mortuary affairs unit and worked 12 to 14 hour shifts at night during the recovery operations at the Pentagon. One respondent’s brother, Ray, was part of FDNY Engine 28 and barely made it out of the North Tower. Ray died ten years later after being diagnosed with multiple myeloma, which his sister believes is related to his work at Ground Zero. Exhibit visitors discussed the ways in which September 11 affected them emotionally. Megan Hornbeek wrote that every time she flies she wonders “if I would have the courage to take my plane down to prevent additional losses.” This visitor said that her daughter felt safer after Osama Bin Laden was killed. Other visitors expressed feelings of hope, with Edward Lopez writing, “The phoenix will rise from the ashes. Always will.” Other visitors were more cautious, including this individual, who said that “we still must learn to forgive. Not forget, but forgive. I still haven’t fully forgiven yet.” Some individuals mentioned an overwhelming feeling of unity with other Americans and even the world. One visitor felt that after September 11 “the whole country became an American. Even citizens of other countries became American.” Visitors also documented their feelings of patriotism, including this respondent, who “became and remain[s] fiercely patriotic.” Many visitors reflected and remembered friends and family who died on September 11, such as this individual whose friends died in the Pentagon, and this respondent whose friends died on American Airlines Flight 77. Visitors to the exhibit reflected on the ways in which they were personally affected by Islamophobic sentiment following September 11. One individual wrote “a classmate…said, ‘Your people are responsible for this.’ Since that day, being Afghan American has taken on new meaning and new importance in my life.” Another visitor said the events of September 11 “made it more difficult for my husband and I to become lawful residents [of the United States]” and began to doubt whether they wanted to remain in the country. They chose to stay. Her husband joined the Army and she volunteers for the Army Community Services. This collection of over 1,300 items is nested under Smithsonian National Museum of American History Collections and would be of interest to people studying memory, historical trauma, patriotic sentiment, Islamophobia in America, and post-September 11 America more generally. The fifteenth anniversary of the attacks on September 11, 2001 is upon us. We see that the legacy of those events continues to live on in current political debates, foreign and domestic policy-making, as well as for the families who lost loved ones on that day and in the conflicts that followed. We at RRCHNM continue to expand the resources in the September 11 Digital Archive (911DA) as individuals and institutions want to share their collections with us. For example, retired Federal Aviation Administration employee Brian Sullivan donated a collection that offers insight into passenger safety prior to and on September 11, 2001 in the form of reports, guides, testimonies of Federal Aviation Administration employees and airport workers, meeting minutes, memos, transcripts, and affidavits. Graduate student Alyssa Fahringer scanned and described the items in the Boston Federal Aviation Administration Filings collection. The Center also recently received digital scans of visitor comment cards contributed at the Smithsonian National Museum of American History on the 10th anniversary of 9/11 in 2011. Alyssa is adding those items this fall. As RRCHNM continues to maintain and add collections, we are also working to improve computational access to these 150,000 digital items. With support from the Institute of Museum and Library Services, the Omeka team is developing plugins that will help users to mine the texts available in the site, and others like it build in Omeka. Individual items contributed to 911DA have rich personal stories to tell that call for a close reading of the text or examination of contributed images. In some cases, a more powerful story emerges by examining the aggregate, with the promise of surfacing larger insights through “distant reading,” an analytical procedure by which researchers evaluate large bodies of text in the aggregate as a way to discern otherwise opaque patterns and meanings. To enable both close and distant reading, simple annotation and word analysis plugins are in development. The Omeka team will use the vast collections of 911DA as a case study to demonstrate the benefits of using the new plugins and to publish new insights found in this corpus of materials. Anniversaries offer time for us to reflect and think back on events from the past, and we again ask for you, your family members, your students to share how your life has changed since September 11, 2001. If you recently visited the September 11th Memorials in New York, the Pentagon, or Shanksville we want to hear about your experiences. By collecting reflections at this commemorative moment, we hope to further the life of the September 11th Digital Archive as one that not only includes the most immediate reactions to the attacks, but also shows change over time as individuals reflect at different points in the post-9/11 world. The Middle East and Middle Eastern American Center (MEMEAC) Interviews is a collection of seventy-one transcribed oral history interviews conducted between June 2002 and June 2003 at the Graduate Center, City University of New York. This collection reveals how Middle Easterners and those of Middle Eastern descent coped and dealt with the backlash aimed at the immigrant community, particularly the Middle Eastern community, in the post-9/11 world. Twenty-five men and forty-three women were interviewed for the collection. Many were young, as the average age of the interviewees was twenty-nine. Each interviewee was asked a specific set of questions, beginning with their background information. Many respondents self-identified as Pakistani, Arab-American, Indian, Afghani, Bengali, Egyptian, Palestinian, Lebanese, Iranian-American, or Syrian. Most respondents stated their religious affiliation was Muslim, although others identified themselves as Catholics, Hindus, Druids, and atheists. After going through the background information, the interviewer asked the respondents about their experience on 9/11, including where they were when the attacks happened, how they reacted, and how they felt when the terrorists were identified as Muslim. Respondents were then questioned as to whether their feelings towards the United States had changed, if they had experienced variations in their levels of political awareness since 9/11, and if they feel a sense of belonging in the United States. Many respondents felt that there was a change in the treatment of Middle Easterners after the attacks, and some respondents personally experienced backlash. Interviewees were also asked if they felt that Middle Eastern organizations supported them by adequately addressing the changing attitudes towards the Middle Eastern community in the US after 9/11, and if they had joined any of those organizations. The interviewer asked each respondent how they think members of their communities can work to improve relations between various ethnic and religious groups, and many thought that education, dialogue, and outreach would be helpful. One of the final questions the interviewees were asked was how the United States can resolve the problem of terrorism directed against it, and some of the responses included: having the federal government promote, create, and maintain isolationist foreign policies; re-assesing America’s policies concerning the Middle East, especially those regarding Israel and Palestine; increasing America’s awareness of problems facing the global community; and gaining an understanding of how American policies are perceived around the world. Nested within the Organizations collection, the MEMEAC interviews would be of interest to those studying the experiences of the ethnic Middle Eastern community in the early twenty-first century; the work of Middle Eastern organizations and Middle Easterners’ perceptions of those organizations; and profiling at airports in the wake of increased security measures. The Middle East and Middle Eastern American Center website provides insight into the Center’s mission, goals, resources, scholastic programs, and more. The Sonic Memorial Project is a collection of over nine hundred items that describe the history of the World Trade Centers (WTC) and surrounding neighborhood through archival audio, radio broadcasts, interviews, ambient sounds, voicemails, and music. Led by National Public Radio’s Lost and Found Sound, the Sonic Memorial Project was a collaboration of radio and new media producers, artists, historians, and people from around the world. The items in this collection vividly illustrate the history of the physical space the WTC inhabited. 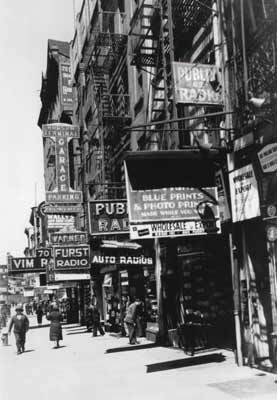 The area that later housed the WTC was first known as Radio Row when City Radio opened in 1921, and grew to encompass six blocks of downtown Manhattan. 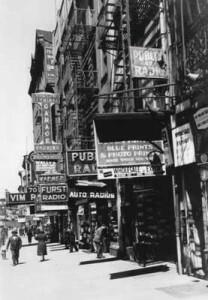 Irving Simon, a Radio Row store owner, describes the variety of objects available for sale in the area, which became the largest place in the world known for selling radios and electronic equipment. In 1966, the stores were bulldozed to make way for the WTC. Mohawk ironworkers were hired to construct the towers and Peter Stacey and Kyle Beauvais describe the dangers of the job. In order to help the public understand the plans for the WTC, construction guides were posted at the site to answer questions and give tours. The guides discuss what an average workday was like as well as the meaning of their work in multiple interviews. In 1971 construction on both towers was complete. Voicemails and interviews within the Sonic Memorial Project describe how the WTC became a site of engagements and marriages. Dr. Elizabeth Grill describes her proposal at the Windows on the World, a restaurant located on the top two floors of the North Tower. In 1996, the Lower Manhattan Cultural Council allowed empty offices to be used as artist studios, and the artist-in-residence program attracted many artists to the WTC. Don Bracken was one of those artists, and describes his time working in his studio. In addition to telling stories of love and art at the WTC, the Sonic Memorial Project documents the events of September 11, 2001. The Project includes radio transmissions from New York’s Fire and Police Departments, as well as accounts of the day. Robert Snyder recalls his morning commute and the “confetti” that confronted him when he got off the PATH train at Broadway. Ken Van Auken, an employee at the WTC, left a voicemail for his wife after the plane crashed into one of the towers. The Project also includes recollections of the aftermath of 9/11 and the various ways people dealt with the tragedy. Marc Wilson wrote a prose poem based on slips of paper he found at Ground Zero. Items in the collection also discuss the Fresh Kills landfill, which was a sorting place for one-third of the rubble from Ground Zero. Mayor Michael Bloomberg spoke at the 2008 closing ceremony. Located within the Audio Collection, the Sonic Memorial Project would be useful for anyone interested in the history of the physical space and the WTC itself, and those interested in the sounds of the WTC and surrounding neighborhood. The original Sonic Memorial Project website has more information about the project and the World Trade Center website provides a comprehensive history of the WTC. After the events of September 11, airport security came under severe scrutiny. Investigations launched with the purpose of determining how terrorists could have passed through security checkpoints. As a result of investigations and the passage of the Aviation and Transportation Security Act, the Transportation Security Administration (TSA) was created and became responsible for the screening of airline passengers. The newly-added Boston Federal Aviation Administration Filings collection provides insight into passenger safety prior to and on September 11, 2001 in the form of reports, guides, testimonies of various Federal Aviation Administration (FAA) employees and airport workers, meeting minutes, memos, transcripts, and affidavits. The testimonies of James Miller, Jr., Theresa Spagnuolo, and Stephen J. Wallace detail the activities of Mohammad Atta, one of the hijackers of American Airlines Flight 11, which crashed into the North Tower. Before the attack, Atta and another man were seen taking videos, pictures, and notes of security checkpoints throughout Logan Airport. The documents also detail standard operating procedures for pre-9/11 security at airports as well as at Massachusetts Port Authority. 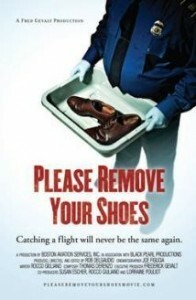 Please Remove Your Shoes is a documentary that discusses the failure of the FAA and the TSA to adequately protect airline passengers. This collection reveals the flaws within the security systems at airports both prior to, during, and after the events of September 11. These documents are a part of the September 11 Digital Archive Collected Reports, which are within the Online User Contributions to September 11 Digital Archive Project. Brian Sullivan, a retired FAA agent, contributed these documents and Please Remove Your Shoes. This collection of documents would be of interest to anyone conducting research into the infrastructure of airport security pre-9/11, the creation of the TSA, and 9/11 litigation and investigations. On this the 13th anniversary of the September 11th tragedy, the Roy Rosenzweig Center for History and New Media is proud to launch a newly upgraded and redesigned site for the September 11 Digital Archive (911DA). The new site boasts improved access to the archive’s collections and, more importantly, increased stability for the materials. A National Park Services’ Saving America’s Treasures grant has made it possible to migrate the materials from their original digital repository to the most recent version of Omeka. The result is that the materials are significantly easier to navigate, browse, and search. Additionally, a range of video collections are available that were not being served previously. The site offers range of data feeds (RSS, ATOM, XML, JSON), and eventually we will be offering API access for researchers and developers who would like to explore the collections in new applications and interfaces. For the past three years, Jim Safley has painstakingly engineered and executed the complex work of this data migration. As a veteran of the project, no one knows the collections the way that Jim does, and his careful attention to detail has assured the integrity of this data as it has made its journey from a labyrinthine hand-coded database to the standardized home in Omeka. Then, Sheila Brennan guided Ben Schneider and Jeri Wieringa as they added additional collection description, massaged the collections into their current organizational structure, and themed the site with the current design. These members of the 911DA team are only the most recent additions to a staff list that stretches back a dozen years and includes Dan Cohen, Tom Scheinfeldt, Marty Andolino, Joan Troyano, Rikk Mulligan, and our many collaborators at the American Social History Project/Center for Media and Learning at the City University of New York’s Graduate Center (ASHP/CML) including Fritz Umback and Pennee Bender, under the direction of Joshua Brown and Steve Brier, who were RRCHNM’s partners on this work from the earliest days. The September 11 Digital Archive originated as an off-shoot of ECHO: Exploring and Collecting the History Online project, funded by the Alfred P. Sloan Foundation, which experimented with new means to collect and preserve the recent history of science, technology, and industry. In the aftermath of September 11, 2001, RRCHNM, again with support from the Sloan Foundation, partnered with our colleagues at ASHP/CML to turn the emerging techniques toward the effort to preserve the collect, preserve, and present the wide range of primary source materials generated by and in response to the events of that morning, especially born digital materials. In February 2002, the first iteration of the 911DA launched with a web portal that made it possible for ordinary people to contribute their stories, upload digital materials, and explore other people’s stories. The site drew in essential contributions channeled through our partners at the Smithsonian’s National Museum of American History, the Library of Congress, The American Red Cross, The American Association of Museums, The Museum of the City of New York, The Brooklyn Historical Society, The New-York Historical Society, The Middle East and Middle Eastern American Center at CUNY, Columbia University, New York University, The Museum of Chinese in America, and many others. In September 2003, the Library of Congress accepted a copy of the collection as it stood at that point as its first major digital accession. In the intervening years, the archive has amassed 150,000 digital files: stories, photographs, digital art images, emails, voicemails, videos, animations, official documents, and oral histories. Together these materials offer a deep record of the immediate aftermath of the events in New York, Arlington, and Shanksville, and their subsequent shifting historical memory, and have been at the heart of much of the existing scholarship on September 11th. At the 10th anniversary of the attacks, RRCHNM reopened the collecting portal and it will remain open to capture public reflections into the future. For RRCHNM, the 911DA is a marquee project that is at the root of much of our subsequent work in digital public history and software development. As our first major collecting project, the archive directly lead to our work around hurricanes Katrina and Rita in 2005, and the eventual development of Omeka as a software platform that could offer libraries, archives, museums, and humanities scholars an easy way to collect, preserve, and present evidence of the recent past. As we mark this next phase in the life of the 911DA, we hope that you’ll revisit the collections to explore what they have to tell us about the events of that September morning, but also with an eye to how important this archive has been to the development of digital history more generally. The popular response to 9/11 was overwhelming. The events, and what to do in their aftermath, consumed the America’s national conversation for months, if not years, afterwards. But while much of the outpouring was that of individuals grieving or trying to come to terms with what had happened, scholars, researchers and other organizations were attempting to put together more formal assessments of the changes brought about that day. The 9/11 Digital Archive collection of reports offers a partial view of the outpouring of material that sought to provide more formal guidance to a distraught nation.The collection pulls together largely unrelated reports from numerous non-profits and think tanks. This collection, unlike others in the archive, is unified by form rather than source or topic, tending more towards white papers and published articles. The organizations represented include official government publication, ethnic lobbying groups, economic and business concerns, and national security think tanks. The reports cover a wide range of topics, rarely overlapping, and offer insight into the effect of 9/11 on the activities of many different segments of American life. Some of these are from professions seeking to address new concerns in the communities they served, like psychiatric associations seeking to give their members the tools to deal with a new influx of trauma patients or those providing literacy and English language services to New York City’s poor and immigrant populations, who disproportionately felt the effects of the dislocations of that September. Others are from groups attempting to establish the extent of the damage that had been done, looking for numbers to gauge the economic damage, or the backlash against ethnic groups perceived as sharing responsibility for the attacks. The year following the attack on the World Trade Center was tumultuous for the city of New York. Placed at the epicenter of events that many Americans felt continued to defy understanding, residents also struggled to make sense of what had happened. The Michael Ragsdale Flyer Collection provides a glimpse into some public discussions that played out on street corners and telephone poles. Flyers gathered daily by Mr. Ragsdale offer us insight into the myriad of issues that concerned New Yorkers. On these pages we see reactions from institutions, advocacy efforts from anti-war groups, and efforts to help people cope with the potential mental health consequences of the attacks. Many sought to address public confusion and ignorance about the events and causes and attempted to diffuse growing tensions between different groups throughout the city and the country. 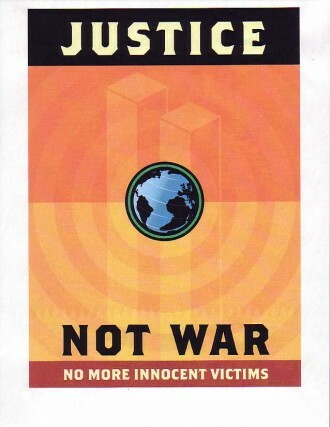 Through the fliers, we can see that much of the debate focuses on the merits and justice of using force in retaliation for the September 11th attacks. Heavily represented in the collection are anti-war fliers, together with items from religious organizations and advocates for public servants (fire, EMS, law enforcement, and even postal workers). Those interested in visual culture and propaganda will find the collection of advocacy posters a useful resource. The artistic construction of these fliers offers insight into design in the early 2000s. While some are hand-drawn, many reflect the increased availability of home computers, image manipulation software, and online images This includes fliers that repurpose older art, make use of clip art, or remix older art with digital photography. While a few demonstrate professional design skills, most are clearly the product of passionate amateurs using the traditional form of a broadside to engage New Yorkers in conversations about their post-9/11 lives. In the aftermath of the 9/11 attacks, there was tremendous uncertainty about how America would respond to what had happened. As discussion shifted to the likelihood, and then inevitability, of a military response, anti-war groups organized to try to stop it, including the Madison Area Peace Coalition. The bulk of this collection reveals the group’s advocacy work, from organizing teach-ins, rallies, and collaborations with other affiliated groups. Other materials include opinion pieces and news articles as well as more general responses to the changing political situation. While the collection offers substantial material to any researcher interested in American attitudes towards war and use of force, it also offers a number of less orthodox avenues for inquiry. Those interested in historical memory and the legacy of the Vietnam War will find lengthy discussions within MAPC of how opposition movements to US involvement in Vietnam shaped their efforts and understanding of the post-9/11 world. For those interested in politics, the collection offers good source material tracing MAPC’s affiliations and efforts to build coalitions and highlight the then growing though tentative connections between the anti-war left and the libertarian movement. Discussion of race and religion in America also feature prominently throughout the collection, particularly as it pertains to Americans of Middle Eastern heritage and practicing Muslims. In the immediate aftermath of the attacks, the members of MAPC were deeply concerned that these communities would be targeted, and actively sought to organize for their defense. The MAPC collection is one of many we will highlight that will give researchers a more nuanced look at the responses to the September 11 attacks. When the September 11 Digital Archive launched ten years ago, the web was mainly a read-only platform and most Americans were not regular users of the web or comfortable sharing personal materials online as they are today. According to the Pew Internet and American Life project, in 2000-01, 30 percent of Americans adults used the internet daily, whereas by 2011, 82 percent of adults used the web daily and nearly 50 percent upload and share photographs online. Conceptualized in the same year as Wikipedia, the September 11 Digital Archive was at the forefront of what became known as Web 2.0, where web users were invited to be collaborators. The Archive invited the public to participate in the process of creating and preserving their own history. Though not the first collecting site of its kind, the Archive certainly became the largest as an outgrowth of the ECHO initiative (Exploring and Collecting History Online). ECHO enabled RRCHMN to experiment with different online collecting tools in an effort to help small organizations build sites to collect and present the recent history of science, technology, and industry. The Archive’s early adoption of social media and collecting digitally allowed the project to capture thousands of first-hand accounts and born-digital materials from ordinary people at a time when other avenues for online sharing did not exist. Using a simple web form, the Archive was open to anyone with an internet connection, and in turn, those collected stories, photos, videos, art works, sounds, were available for anyone with web access to browse. To reach those without ready access to the Internet, we established partnerships with labor, ethnic, and community associations to create special collection outreach efforts. Drawing upon the instincts of oral history projects to seek out stories from witnesses, the Archive did so in much greater numbers and at much lower cost than would have been possible using traditional oral historical or archival methods. The success of the September 11 Digital Archive as an online collecting site motivated others to build sites of their own. This response heavily influenced RRCHNM to develop a standalone digital collections and memory banking software, enabling anyone to quickly launch a digital memory bank to document or commemorate events deemed significant. That software would become Omeka. One of the earliest projects built on the software that would become Omeka was the Hurricane Digital Memory Bank, which launched soon after the devastating hurricane season of 2005 and collected over 25,000 digital items. The Hurricane project helped RRCHNM test the earliest versions of Omeka and aided in the development of the popular contribution plugin. Soon after the Omeka software was available in 2008, other collecting projects launched including Virginia Tech’s, April 16 Archive and the Catawba River Docs. As we continue to migrate the 150,000 digital objects in the Archive to the more stable Omeka platform, we are reminded how significant this project was when it started. And, we are grateful that the National Park Service and National Endowment for the Humanities designated the September 11 Digital Archive as an American treasure worth saving. Copyright © 2002-2014, Roy Rosenzweig Center for History and New Media and American Social History Project/Center for Media and Learning.